Today I'm going to share a famous kid song "Ni Wa Wa" (Mud Doll). You'll use words for body and family which I posted some in "Big Elephant", "Head Shoulders Knees and Toes" and "2 Tigers". Copy any sentence in Chinese above and paste in the box below then hit "Search". The traditional characters are at the right side where it says "Traditional variant". If you see a blank that means the character's traditional version is the same as simplified version. They have traditional and simplified version, stroke order animation & dictionary including pronunciation and explanation, flashcards, worksheets, tools and Chinese radicals. Questions? Please comment, I'd love to hear from you. Click HERE. Thanks for commenting, James and Cheah. I tried to put the dictionary in my sidebar but my sidebar is too narrow and I don't like how it appeared. I'll try again see if there's other solution. I suspected this what you can do change the dimension with the example extracted from the 'MDBG' link below. When you copy paste the "html" link make the changes according to your space on a trial & error. Mine is w=200 & h=125. If this is still too big lower 'em slightly. Thanks for your detail help, Cheah. I appreciate it!! I think it appears ok this time. Aries, I would love to. I only need you to click on the yellow button on top right of my blog to subscribe as my free member. 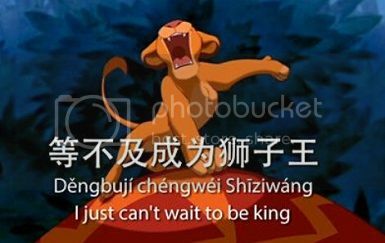 That song is quite difficult for Chinese people let alone non-Chinese speakers. But it's very interesting. I'll post it this weekend. Teriffic song. I found it very easy to pick up the sounds. I will want to come back and practice. I'm glad that you found the song easy to pick up. Thanks for the comment!